It’s time for our winter Flux Open Studios 2016! We have lots of exciting new jewellery to show you by the studio jewellers at Flux. Let us share with you our passion for making beautiful objects. We plan to tantalise your senses. Enjoy the lustre and the dazzling array of colours in our newest works. Feel the seductive quality of our materials and finishes. Hear about our current inspirations – each of us has a story that unwinds through our making. Appreciate the aroma of Christmas spice from a glass of something warming. And as for great taste, you’ll be experiencing that the minute you walk through the door! Take the opportunity to also enjoy ceramics, painting, textiles, painting, sculpture and more by the artists and makers of Vanguard Court. We’ll have a map ready for you to guide you to all the open studios. Remember to collect stamps along the way so you can enter our prize draw. This is your chance to win a box full of hand made treasures! 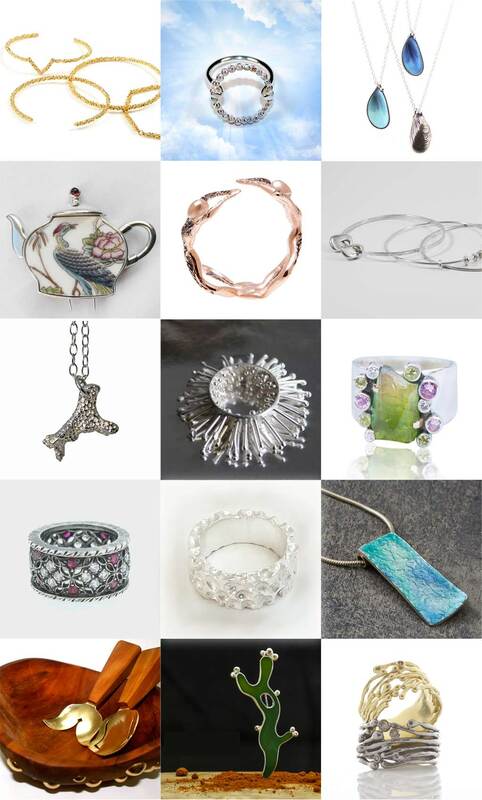 Studio 2A is also a jewellery and silversmithing studio, showing work by Haru Sakai, Jane Glibbery, Sue Wainwright and Michelle Clare. If you like stone work check out Studio 3 where you will find stone sculpture by Corin Johnson. Down the yard in Studio 4A you will find ceramics by Catrin Howell and Sun Kim. Studio 7C is where you will find ceramicists Carina Ciscato and Chris Keenan. Upstairs in Studio 7L Laura Carlin and John Mahoney-Philips will be exhibiting their latest ceramic works. Also upstairs, in Studio 7N you will find textiles by Catherine-Marie Longtin and millinery & veils by Jennifer Levet Millinery. Lots more beautiful textiles will be on display in Studio 7V – Textiles, Bags by Kyoko Wainai. Also, seek out Studio 10 where you will find sculpture, painting and mixed media by Helen Lodge, Caroline Popham, Matthew Newsome and Ben J Hartley. Tagged Alex Yule, Barbara Yarde, Barbora Rybarova, Bianca Bovell, Elena Timbaliuc, Eve Demetriou, Flux Studios, Heidi Agbowu, Ilona Guest, inspiration, investment, Jessamy Harvey, Jewellery, Maggie Laing, Marina Boshnakova, Millie Jarvis, New Works, Raffaella Nisi, Rebecca Dockree, Vanguard Court, Vicky Forrester, weekend. Bookmark the permalink.